Our kitchen is still in kitchen reno chaos, so I’m still outside using my little outdoor kitchen. That means lots and lots of grilling. Thankfully it’s already pretty warm here in Florida, so using the outdoor kitchen is pretty easy. 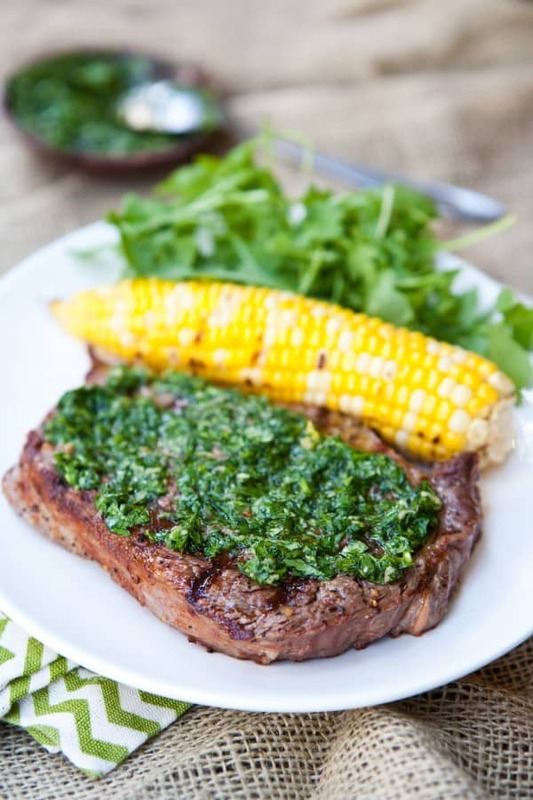 For last night’s dinner, we made these amazing rib-eyes with a simple cilantro chimichurri. I usually wait and get my steaks at our local nicer grocery store chain when they’re on sale. So maybe once every week or so, we’ll have steak for dinner, not too often. I usually shy away from steaks at big box or wholesale stores. However, a few weeks ago, WalMart asked a few of us bloggers to have a grill off and try out their USDA Choice Premium Beef. Of course I was skeptical. The last time I bought steak at a discount store, it tasted like shoe leather. But I was intrigued, especially after that commercial when they’re serving everyone WalMart steaks, and no one has a clue. So I decided to serve my picky steak eating husband a WalMart steak. Now when I say he’s picky, he’s picky. He will only eat steak at one restaurant in town. And he just recently hasn’t been finding fault with the steaks I make for him. So I was a bit on pins and needles when he first cut into that rib-eye. But bite after bite, he got quieter and ate quicker. That’s how I can tell he likes something. And as I ate mine, I couldn’t believe how good it was myself. When I told my husband at the end of his meal that he just ate a WalMart steak, he was so surprised, he couldn’t believe that he didn’t notice a difference between the higher end grocery steak and WalMart steak! Why was that steak so good? Well WalMart has given their steaks a Steak-Over. All their beef is USDA Choice Premium Beef. Did you know that only one if five steaks is good enough to call WalMart Choice Premium beef? Heat grill to high heat. Allow steaks to come to room temperature and add steak seasoning along with chipotle chili powder to steaks. Grill over high heat until desired doneness. In a separate bowl, add very finely chopped cilantro, minced garlic, olive oil, salt and pepper. Stiri to combine. Serve steaks topped with cilantro chimichurri. To spread the news about WalMart’s amazing steak, they are traveling to eight different cities this spring and challenging local firefighters to determine who has the best steak-grilling chops in town. The challenge is presented by Kingsford, Dr.Pepper and A.1. steak sauce. Shoppers who attend the events (which will be held in the parking lots of their local stores) will have a chance to join the fun, taste test WalMart steaks for themselves, and then cast their vote for the best steak. The firefighter finalist from each city will compete on behalf of their station for a $20,000 grand prize in Los Angeles, the week of May 20. For even more recipes, grilling and cooking tips and find a store near you visit, www.walmart.com/steak. Are you ready to experience Walmart’s Steak-Over for yourself? 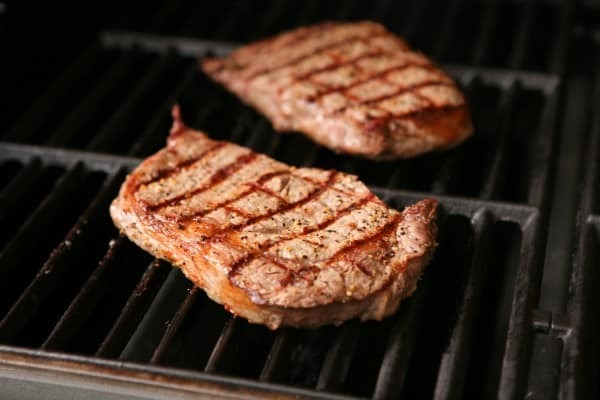 Find out why you should choose your steaks at Walmart here. We shared our winning grilling tip – now tell us yours! I would love some cilantro chimichurri right now! Excuse me while I wipe the drool off my face… Seriously, I could dive into this right now! 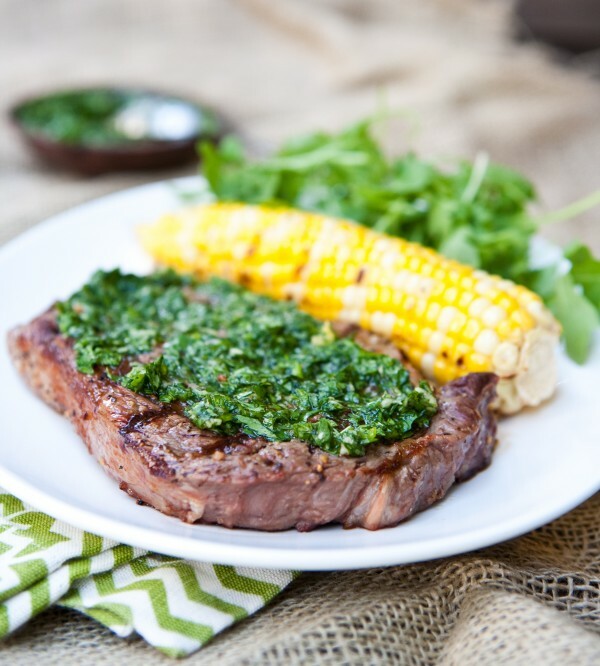 That chimichurri is out of this world! Delish! We’re picky with our steaks around here, too, and rarely order one at a restaurant, preferring our own on the backyard grill instead. I love this version!